If you’re standing, sit down. Because you’re about to learn the terrible secret Apple doesn’t want you to know. Hang on a second. Apple is profiting from these phones?! For all the talk of thinking different, of experiences that only it can create, and marketing that strips away any sort of comparative detail to the competition, Apple is a company that makes money. The recent launch and release of the iPhone 7 and iPhone 7 Plus are great examples of how Apple can extend its influence and create more revenue and income from what is arguably the same handset as the one released in 2014. Is there anything more indicative of the foppish fecklessness of the technology press than claiming the iPhone 7—which is significantly faster, has a better camera, 3D Touch and a Taptic engine, comes with more capacity and in different color options and is water-resistant—is “arguably the same handset” as the iPhone 6 because the dimensions are mostly the same? If you cover technology and are promulgating this argument, you are failing at your job. 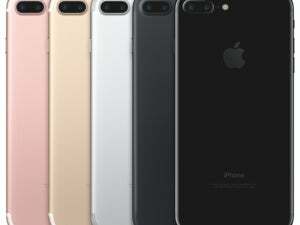 The iPhone 7 and iPhone 7 Plus are evolutionary devices, and for all of the critical acclaim that the handsets have picked up from the geekerati, they are not magical devices. When the Macalope got up this morning he didn’t think he’d have to explain to an adult that magic isn’t real but… here we are. Spence complains again about Apple moving the camera position and, of course, the loss of the headphone jack (even though Apple includes an adapter in the box which actually raises the production cost). The loss of the headphone jack also takes away a component that experiences a significant amount of wear and tear, and triggers many warranty repairs over the retail life of the iPhone 7 handsets. Yeah, it also triggers non-warranty repairs which are a cost to the owner. Point of fact, any repair is a cost to the owner in time. …it’s worth noting that many Apple Care repairs will trigger an excess charge depending on the repair and you are limited to the number of “accidental damage” repairs during the warranty period. It also might be worth noting that Apple lowered the cost of replacing the screen under AppleCare this year from $99 to $29. It might be worth noting that unless you were writing a ridiculously one-sided piece about how a company might be making money. …rather than the plastic carry case that has shipped with every previous model the headphones are wrapped around a cardboard spindle–another cost saving but one that directly impacts the user experience. This is the second time Spence has complained about this and neither time has he mentioned the actual reason Apple did that which was to make its packaging more biodegradable. It’s almost as if organizations and customers have been lobbying Apple for years to be more environmentally friendly. But, nah, it’s probably just to make a quick three cents. Spence goes on for three pages without mentioning how any of the changes to the iPhone 7 also reduce costs to the owner or that the addition of new components like the Home button, Taptic engine and dual speakers represents an additional costs. These one-sided diatribes are popular with pundits because they avoid the messy work of having to compare tradeoffs and are ready fodder for salacious headlines. If only they were useful.